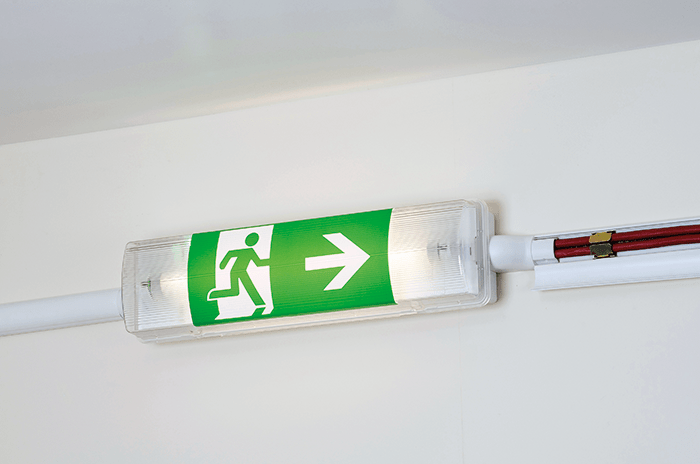 We are now past the 1st July 2015 deadline for installers being compliant with a new wiring regulation in the UK to secure cables of all categories in escape routes by non-combustible means. The problem has been that many types of wiring system have fallen from walls and ceilings at the early stages of a fire leaving cables hanging. These cables have become entangled around the firefighters’ breathing apparatus and/or uniform leaving them trapped and running out of air. This directly caused the deaths of eight firefighters in the UK between 2005 and 2010. The evidence from these tragic events helped to drive this change in legislation. In Note 1, there is particular reference to failure of non-metallic trunking leading to cables hanging across access/egress routes hindering evacuation/fire-fighting activities. In Note 2 it specifically states this precludes the use of non-metallic clips, cable ties or trunking as the sole means of support. For example, where a non-metallic cable trunking is used, a suitable fire-resistant means of support/retention must be provided to prevent cables falling out in the event of a fire. Many contractors, large and small were ready to meet this new requirement when it came in and had already adopted the use of fire-resistant cable clips in May and June 2015 on contracts that were going to be certified after the deadline date. However, there still seems to be some uncertainty within the contracting community as to exactly what is expected of them to ensure that completed installations are fully compliant. This is particularly so on larger and more complex installations such as airports, ferry terminals, shopping centres, hospitals, schools, colleges, universities and historic buildings. They are now looking for guidance and confidence from the electrical design engineers and specifiers in the form of specific product recommendations so that installations are fully compliant and safe. D-Line clips securing utility cables. Image courtesy of D-Line. D-Line (Europe) Limited are the only company that have launched and provide a range of fully tested and certified fire-resistant clips to meet this demand. The clips were tested by Exova Warrington Fire, confirming compliance to BS5839 part 1 section 26.2e – resistance to fire with mechanical shock and resistance to fire with mechanical shock and water spray – both for 120 minutes. The tests confirmed that Safe-D clips, when containing Enhanced Fire Performance 1.5mm 2 core cables, and subjected to 930°C (+40 -0°C) for 120 minutes at a voltage of 500V rms, enabled the cables to maintain circuit integrity – a key requirement for essential wiring systems. This is the highest requirement any cable type is ever liable to need, thus more than sufficient for all other cable categories. D-Line has closely monitored contractor reactions in the market place since the launch of its larger clip sizes in May 2015 (the smallest clip, the Safe-D30 has been available since 2006!). In the main, 2 questions emerge more often than any others. D-Line clips securing fire rated and utility cabling. Image courtesy of D-Line. When and where do I have to use these clips? Designers and specifiers now need to start telling contractors how they expect them to do this. 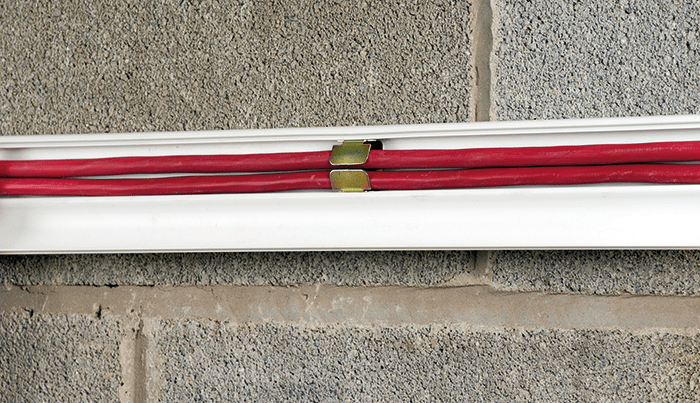 PVC plastic trunking used alone to carry cable in these areas is now specifically excluded – however, there is a way to make it compliant. The Safe-D clip range from D-Line works equally well either fixed within proprietary plastic trunking or fixed direct to substrate. So, the first question is whether or not you need to use trunking at all. 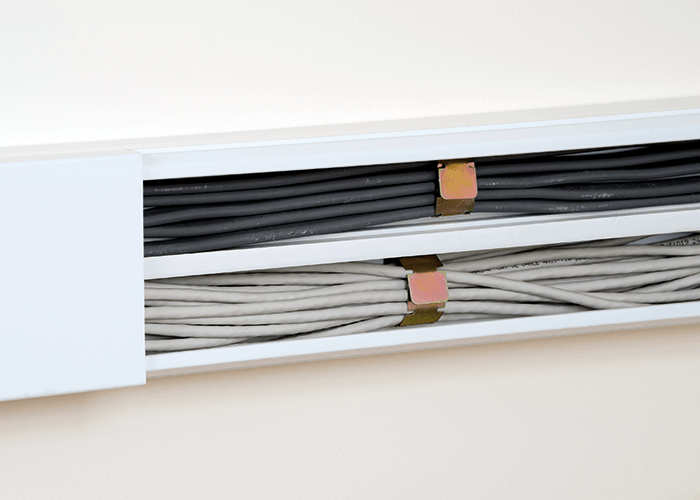 In back of house areas such as corridors and ceiling voids for example, cables can easily be retained inside Safe-D clips alone – this saves on cost and even time since wiring changes within trunking will take longer even if you just consider taking lids on and off! 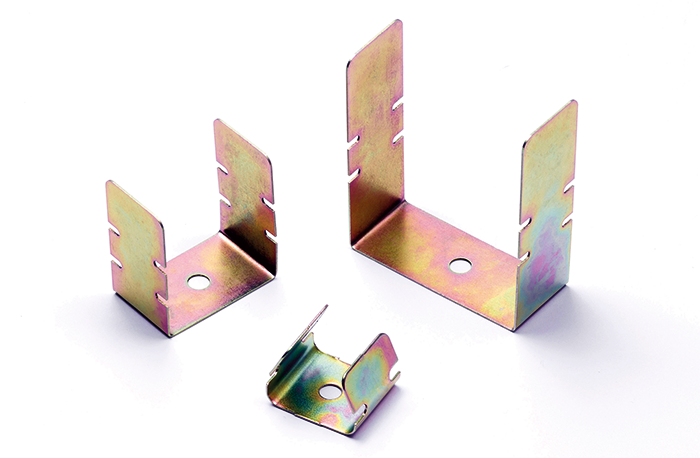 In front of house areas where appearance matters more, then Safe-D clips fit snugly inside all PVC plastic trunking from sizes 2 to 8 inclusive. Fixing time takes no more than before since the trunking is fixed back to the wall by fixing through the clip holes, thus all that needs to be factored in by the estimator is the cost of clips per metre. Fixing intervals are determined by the cable manufacturers’ recommendations and/or common sense. Surprisingly, there are a number of products and proposed ‘retention solutions’ out on the market that are untried, untested, non-certified and not even cost effective. Some are actually non-compliant as they infringe other design criteria – most specifically 522.8.11 – because they have very sharp edges liable to damage cable and injure installers! Why isn’t this usage being stopped? They are being used because designers and specifiers are not listing certified products in their specification sheets and therefore contractors are just doing what they think is right – so is this correct given that we are talking about life safety issues here? Shouldn’t best practice be application of certified, engineered fire safety solutions every time wherever and whenever it is possible? Simply listing properly tested and certified products eliminates all doubt. This practice is followed in countless other aspects of electrical installations and beyond – so let’s start the practice here. Passive fire protection products play a vital role in protecting lives and property in the event of a fire and the importance of correct installation is often seldom considered. It seems obvious, but when fixing a fire-resistant cable clip, isn’t it only sensible to also fix them by non-combustible means? The absolute best way to fix the Safe-D clips is with masonry screws. They are simple, relatively inexpensive products with fixing load capacities way above what is needed in this application. Many of these screws will even self-drill into softer substrates if the flutes are wide and sharp enough. Harder substrates may need a small 4mm diameter pilot hole to get them started. For those installers on larger contracts involving thousands of fixings, a better way again may be to use gas-fired nailing systems and firing the nail straight through the clip itself– consult with a fixing specialist for this on best and safest practice. Safe-D clips have been met by many sources within the electrical wholesale and contracting marketplaces with particularly positive comments. Their unique and patented design allows the strong yet pliable 20mm wide tabs to be folded over neatly to safely retain all cable types. The installer can select the fold point appropriate for the number and types of cables being fixed by choosing from a selection of cut-outs at 10mm intervals along the sides of the larger clips in the range. The smallest clip only has one fold point because it is designed to only hold one or two cables. The selection of sizes came about by researching and measuring the internal widths of many types of PVC trunking to find the optimum sizes to use on the base of each clip. Consideration was also given to how the lids were fitted. The designer used his imagination and initiative to create a range of only 3 sizes of product that, when fixed correctly, meet the requirements of this legislation when used within any and all of the proprietary PVC trunking systems on the market in sizes from 2 to 8. Its simplicity and value was so high that customers identified it as a quality, value for money product and immediately started buying it when brought to the market. The proof of this is that it sold 212% of the annual volume of an earlier form of the product in the first 8 weeks after launch – that’s over 2,000 per hour! Further affirmation of its early success and acceptance in the market has come from the invitations to submit the product for 3 categories in this years’ Electrical Industry Awards (most particularly for innovation) as well as ‘Passive Fire Innovation Product of the year in the Security and Fire Excellence awards in November 2015. D-Line (Europe) Limited are now actively looking for medium to large scale projects where Safe-D clips could be used to provide an efficient and cost-effective contribution to cable retention. If you are working on such a project and are happy to be part of a case study where we both share the resulting positive PR then please get in touch. Steve Riszko is a product designer and developer with a reputation for pragmatic yet simple solutions to engineering challenges on some landmark projects in the UK and beyond. He ran the largest steel fire door company in the UK for 5 years where he pushed R&D hard – particularly for a 2.4M x2.4M 240 minute door to meet the plant replacement programme at London Underground which is still being used today.